Once a year we go on a group camping trip and all combined there are about 30 of us. This year we are doing 2 group pot lucks where each family provides one themed food item, one themed drink and one theme decoration. Our themes are; a Mexican Fiesta and a Greek night. Combine the lime juice, tequila, Triple Sec, and pineapple juice. Fill a cocktail shaker 1/2-way with ice and fill 2/3 full with the margarita mixture. Shake for 30 seconds and pour into glasses. 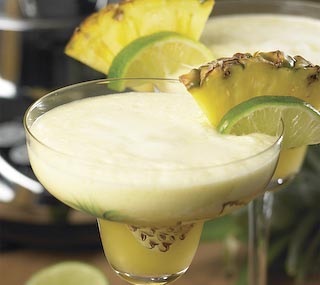 Decorate with fresh pineapple slices and serve ice cold. ← What To Get The Camper Who Has Everything? You Have Got to Be Kidding! Alice Lake Provincial Park - Squamish, BC. 5 Simple Solutions for Broken Tarp Grommets. More Cool Tents. Would Love To Camp In These! RV Ovens - 10 solutions every camper should know! Griswalds Redux: Hitting the road! You'll have to decide that for yourself! World, lets FEEL Better by EATING Better!